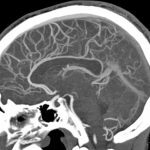 CT is fast: CT imaging of the brain requires only a few seconds on modern scanners. Sedation is often not required, even in young children. 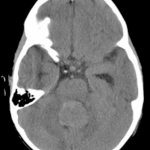 Therefore, CT finds wide use in the evaluation of patients with acute neurosurgical conditions, including trauma and hydrocephalus. Best choice for bones: CT surpasses all other techniques for evaluation of the skull and facial bones swell as the spine. CT is indispensable for the accurate evaluation of fractures and developmental anomalies. Minimize radiation dose: CT scans require the use of ionizing radiation (x-rays). 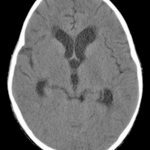 Accordingly, CT scanning should be avoided when other suitable alternatives are available (for example, MRI or ultrasound). When CT scanning is required, parameters should be chosen that minimize radiation dose. Additional information is available from The Alliance for Radiation Safety in Pediatric Imaging (5, 10). Summation imaging from multiple angles: CT scanners direct an x-ray beam through the patient and record the amount of radiation reaching a detector on the opposite side. During CT scanning, the x-ray source and detector are rotated around the patient to obtain measurements from multiple angles. A mathematical algorithm is applied to these measurements, resulting in anatomical CT images. Brightness reflects density: Brightness on CT images reflects the radiodensity of corresponding tissues—denser structures are brighter. Hounsfield units quantify density: Radiodensity on CT is quantitated in Hounsfield units (HU). Tissues are distinguished by their characteristic Hounsfield measurements: Fat -100 to -50, simple fluid 0–20, brain 20–50, bone 500+. The Houssfield density of blood is typically 40–45 but it will vary with changing hematocrit, . Helical versus conventional image acquisition: Conventional axial CT images are acquired sequentially, one slice at a time. Modern CT scanners also allow continuous (helical) acquisition. Helical acquisition is faster, facilitating dynamic CT techniques including CT angiography. In some circumstances, helical acquisition also permits decreased x-ray dose. 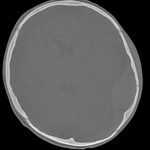 Uses for CT images of brain and skull: A CT scan of the head allows identification of skull fractures, intracranial hemorrhage, hydrocephalus, and tumors. 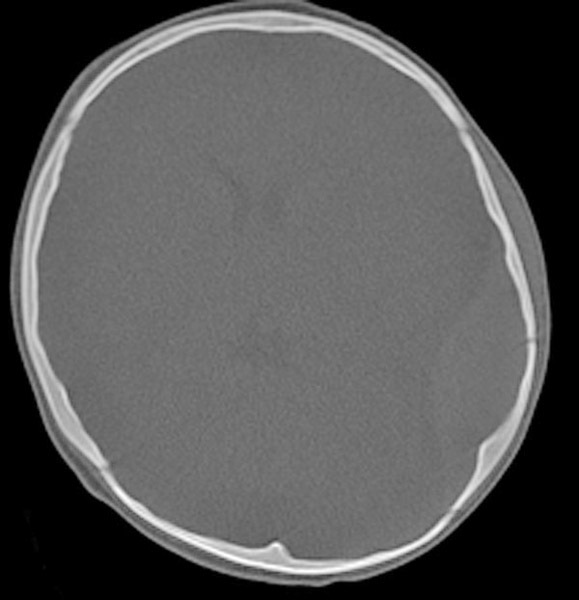 CT of skull: CT image “windowed” for bone showing a skull fracture on right side at apex of tempoparietal curve. 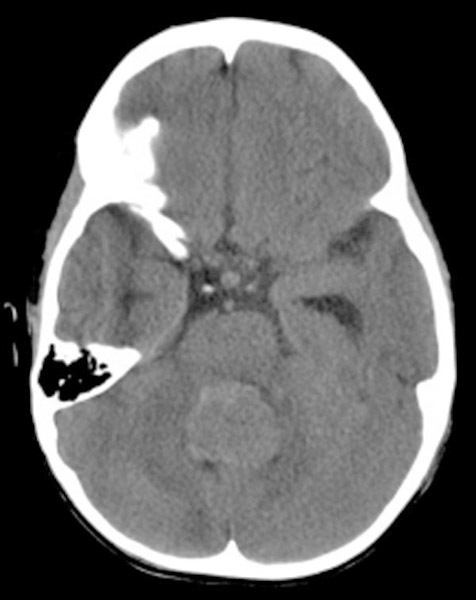 Non-contrast CT of brain: Shown is an epidural hematoma underlying the skull fracture shown in the previous image. 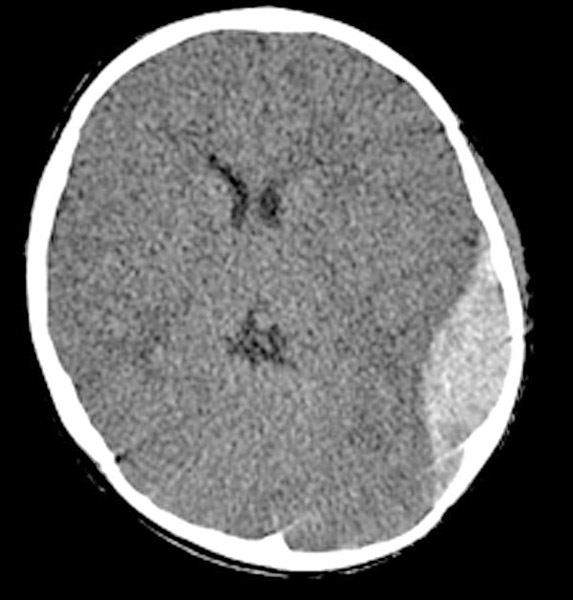 Non-contrast CT of brain: Shown is a CT of the brain with a tumor filling the fourth ventricle. 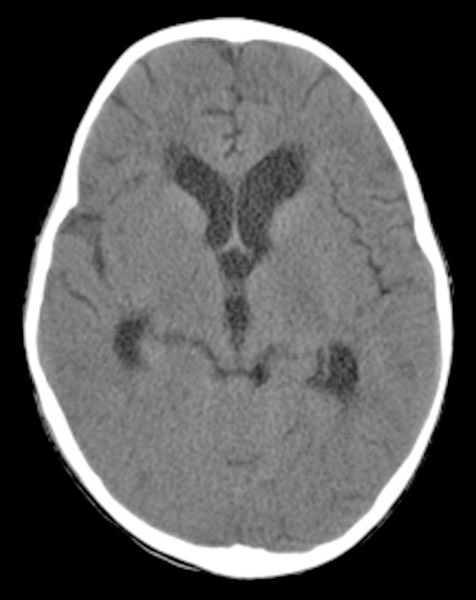 Non-contrast CT of brain: CT image showing obstructive hydrocephalus caused by fourth ventricular tumor shown in preceding image. 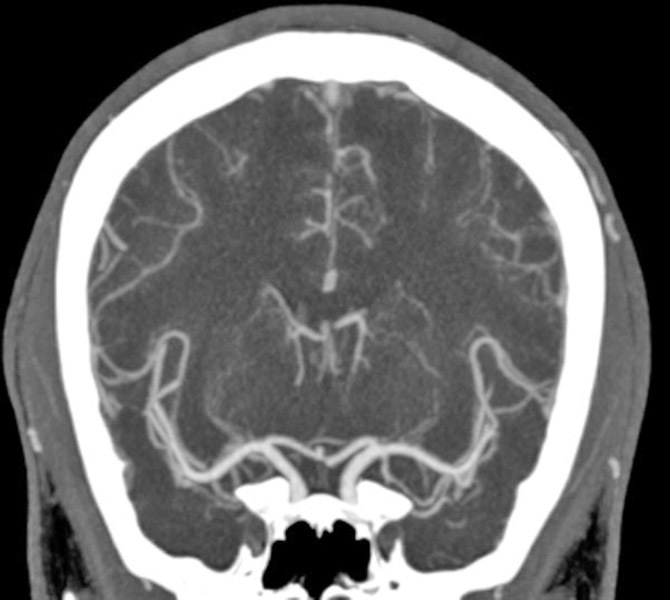 Note hypodensity surrounding frontal horns of the lateral ventricles, reflecting transependymal flow of cerebrospinal fluid (CSF), a finding seen in ventricles containing CSF under pressure. Angiography methods demonstrate the arterial and venous anatomy. Modern multi-detector CT scanners allow extremely rapid acquisition of high-resolution CT images. The acquisition can be synchronized with the injection of intravenous contrast to obtain images of the arteries and veins—a CT angiogram. 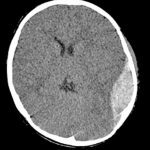 Frequently used in place of invasive angiography: CT angiography, together with MRI angiography, has largely replaced invasive cerebral angiography in children. Iodine-based contrast used: CT angiography requires the use of intravenous iodinated contrast material. Iodinated contrast can cause renal toxicity (contrast-induced nephropathy). This is primarily of concern in patients with preexisting renal impairment. The risk of contrast-induced nephropathy can be decreased through the use of low-osmolar contrast and by limiting the dose of contrast. 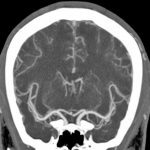 Image timing determines which vessels are imaged: Timing of the contrast injection can be optimized to evaluate either arteries (CT angiography) or veins and venous sinuses (CT venography). High radiation dose: Radiation dose from CT angiography is relatively high. Alternatives, including MR angiography, should always be considered. 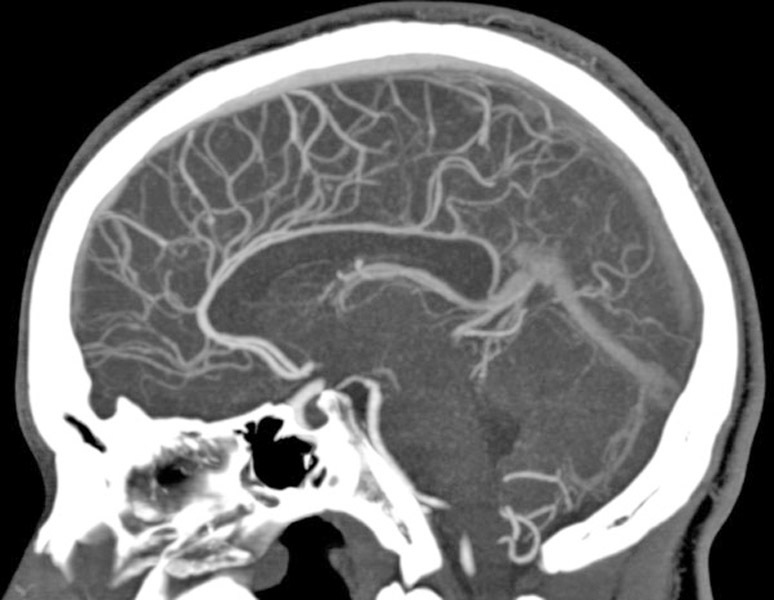 CT angiography of the head: This coronal image and the sagittal image to the right show normal intracranial vasculature.